The Biogas Technology (BT) offers an efficient way of biomass utilization. It involves anaerobic fermentation of organic materials such as animal dung, agricultural wastes, aquatic weeds etc. to produce methane rich fuel gas and a value added organic fertilizer. Thus, it has considerable potential for providing fuel and fertilizer besides being on efficient system for recycling waste of prevention of pollution, ecological imbalance and improvement of sanitary conditions in the rural areas. Pakistan Council of Renewable Energy Technologies (PCRET) under took propagation of Biogas Technology as early as in 1976, based on imported Chinese Design and then initially installed 21 family size units. But afterward due to various factors such as gas pressure variables, lack of craftsmanship, leakage occurring in the dome, hindering good performance of gas produced through fermentation process, the council adjourned the programme. Thereafter Indian design was adapted with some modifications, suitable to local conditions and afterward a project for installation of 1,200 family size biogas plants on public - private cost – sharing basis was launched. In view of prompt and positive response of the people the project ended by installing 35% additional biogas plants than the target originally set forth in PC-1. (Actual 1,604 units installed against target of 1,200 units). Encouraged by positive public response, PCRET launched another project for installation of 2,500 biogas plants in 2007 with a subsidy component of Rs.17000/- per plant. In the last two years despite various financial constraints, about 2,000 biogas units have so far been installed successfully whereas work on other 500 units is in progress. Originally, biogas plants were constructed for cooking purpose only. But in view of the current energy crises i.e. rise in prices of fossil fuels; increase in electric utility tariff and heavy load shedding which has severely effected the life of common man and the economy, possibilities were further work up for utilization of biogas on commercial scale. Thus over the period, demand from the public has compelled PCRET to explore ways and means of using biogas for lighting as well as irrigation purposes. Keeping this aspect in view, PCRET came forward to make possible the usage of biogas in generating power for lighting, refrigeration, electric fans, mobile charging, running washing machine and iron for pressing clothes etc. 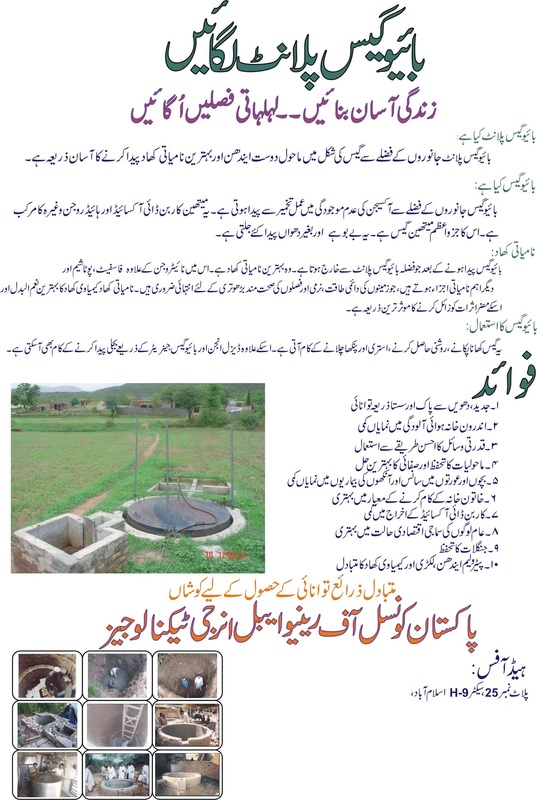 Besides the galloping prices of diesel coupled with its irregular supply has compelled agriculturist to use biogas as duel fuel (diesel + biogas) for running their tube wells. 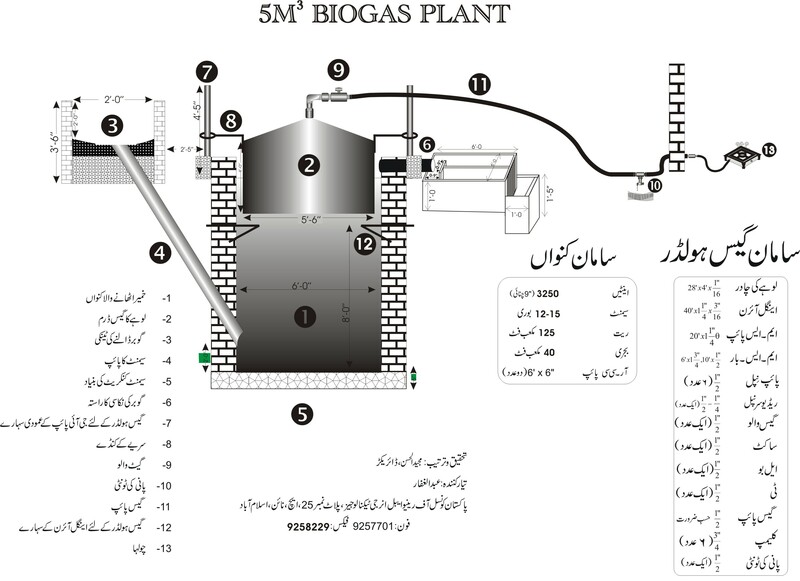 For this purpose relatively a bigger size biogas plants (10M3, 15M3, 20M3 gas production capacity per day) have been designed and installed in Sialkot, Narowal, Jhang and other places. As per field reports, the success rate of such plants is very high. As per recent livestock census, there are 51 million animals (Buffaloes, Cows, Bullocks) in Pakistan. Thus, 19.125 Million M3 biogas can be produced daily by anaerobic fermentation of dung through installation of about 3.825 million family size biogas plants, which could meet the cooking needs of about 50 million people. The total population of Pakistan is about 170 million, out of which 68% reside in the rural areas, which comes to be 98 million. Therefore we can meet the cooking / heating requirements of 44% rural masses from this single source of energy (biogas) besides, producing 57.4 million Kg of nitrogen enriched bio-fertilizer per day or 21.00 million tons of bio-fertilizer per year, which is an essential requirement for sustaining the fertility of agricultural lands. In view of the prevailing situation, promotion of the biogas technology (B.T.) seems to be one of the best options which could, not only partially offset the fossil fuel and fuel wood consumption but also could facilitate recycling of agro-animal residues as a bio-fertilizer. Moreover, being clean and renewable, it would also contribute towards environment protection, sustenance of ecosystem and conservation of biodiversity. There is however, a tremendous need to promote public awareness, in particular, among youth and women, on the use of bio-energy (biogas) and bio-fertilizer and also to create awareness and know-how about eco-system management, conservation of bio-diversity and sustainable use of natural resources. Due to mass Social acceptance, the Government of Pakistan has asked PCRET to launch mega project on the biogas technology by installing 25,000 biogas units all over the country to not only cater the needs of cooking but also for agriculture and commercial purpose in order to meet the shortage of gas and electricity in the country. It is hoped that after approval from concerned quarters the project will pave way on mass-scale dissemination of an environment –friendly technology; which apart from being green has enormous benefits to the public at the country.